I really enjoyed myself in this pool. I’m not sure how many Poms they get in here because the lifeguard kept me chatting about Lancashire and Yorkshire connections for about 15 minutes before I could actually start my laps. When I began my swim, I was sharing the entire Olympic pool with just one seagull, though he (or she) was joined by two others as I ploughed up and down my lane. 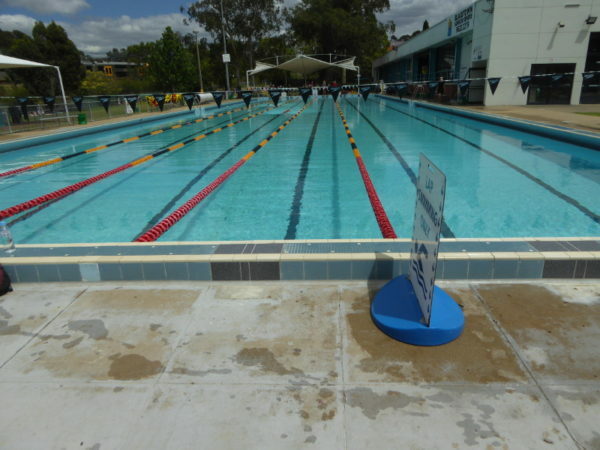 Mind you, I say lanes, but there are no handy land ropes to keep you on the straight and narrow for backstroke (freestyle is fine because there are lane markings on the floor of the pool); nor are there those useful lines of bunting across each end about 5m from the end of the lane, so you need to do a good stroke count to avoid banging your head against the wall you’re heading towards. By the time I finished, there were a few other locals in the pool with me, and everyone was very friendly, with some sort of exchange of pleasantries with each of them at some point. And two of those lads were from communities that often get a bad press in Australia, so the press could do with meeting more boys like that when they profile certain groups in the country. Berkeley itself gets a dreadful press, and some of the housing around the pool has probably seen better days, but this was actually the friendliest pool I have been in for some time. 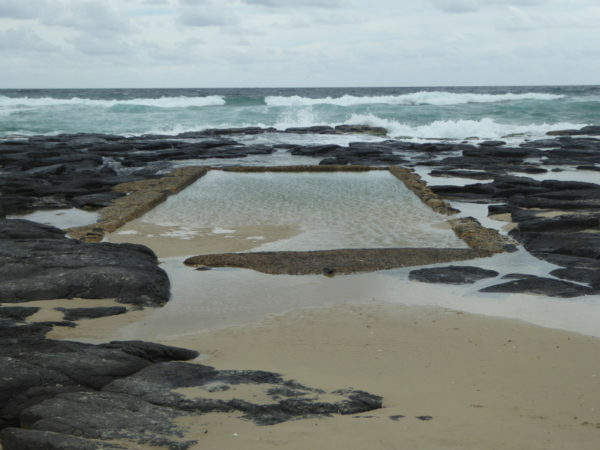 Credit to Wollongong Council again, it’s all free to swim. 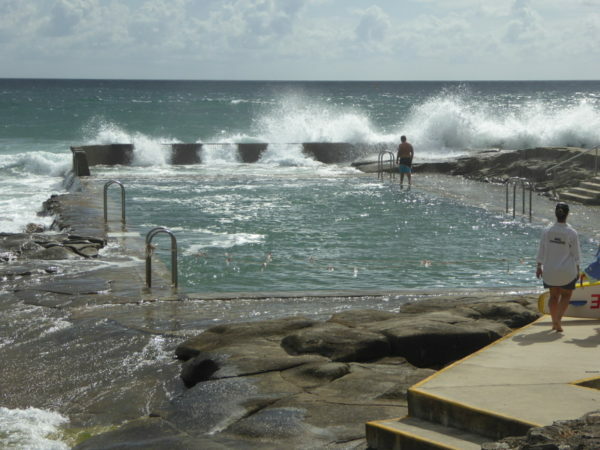 It would be nice to see a few more pensioners or other people with free time during the day swimming in here, as you do in many other free facilities. I gather the pool fills up with school kids at the end of a warm day, but they could do with a bit of a media campaign to up the usage during the quieter times. I’d hate to see this facility close for lack of patronage. Oh, and in spite of the rather lifeless shops and down-at-heel housing around about, the pool has been nicely designed, with a line of palm trees at one end, to remind you of where you are in the world, as well as proving a useful line marker for that dodgy backstroke of mine. It took me a while to find the pool car park, which is to the left of the front entrance as you face the pool. There are lots of buses to Berkeley from Wollongong. Nice wide steps to get in at the shallow end. Cold showers only in the spacious changing rooms – but, hey, this is a free facility. How much do you want for nothing? 50m pool + shaded paddling pool. Olympic Pool depth goes from 1.4m in the shallow to a lovely 1.9m in the deep, though I fancy it was at least 2m on the day I swam because even dunking myself and pointing my toes down I could not reach the bottom. Closed end of April to mid-September. I found nothing written about this pool, and no information even on when it first opened. 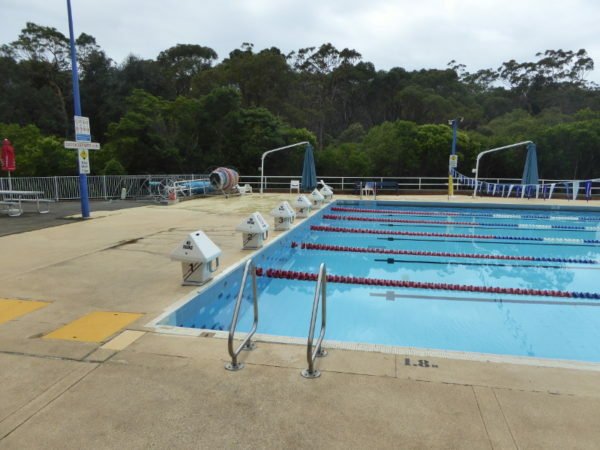 I found just one article in the local newspaper, the Illawarra Mercury, from 2014, reporting on the threat to the pool’s future because of falling attendance. A little touch of Far East exoticism comes to the Illawarra, with a tea house that would feel quite at home as a quiet haven in a bustling Chinese city. The tea menu is decidedly Chinese in style – we chose a delicious chrysanthemum tea (all flowers opening out in a glass tea pot), though the cumquat tea also sounded tempting. If you want a standard black tea with milk, they only offer one of the insipid big brands in a bag, so my advice is to go oriental. They do coffees too but when in a Buddhist temple, tea is my tipple. Nice home-made almond biscuits to go with the tea. A lovely, relaxing spot among the Buddha statues and bamboo trees.